OTTAWA -- Immigration Minister John McCallum says there could be a better way to accept applications for a coveted sponsorship program other than the current system, which has some couriers charging hundreds of dollars to deliver files. But McCallum is not committed to making any changes, saying only that the government has a year to review the process before the parent and grandparent program re-opens. The Canadian Press reported this week that couriers lined up at a Toronto-area immigration office hours before the program opened for applications on Jan. 4 and, in some cases, they charged clients as much as $400 in order to guarantee their file would be among the first submitted. Only 5,000 spots are currently available in the first-come, first-served visa program, though the Liberals have promised to raise the cap to 10,000. Over 14,000 applications were received this year and the Immigration Department is holding on to the excess files pending that increase. 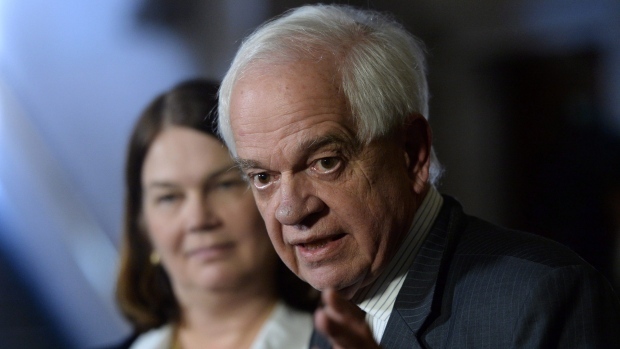 McCallum suggests the higher cap would come with the release of the government's overall plan for immigration in 2016. The parent and grandparent sponsorship program only accepts applications by mail or courier to the processing centre in Mississauga, Ont., and since it re-opened in 2014 with a cap on applications, it has hit that ceiling within the first few days. McCallum's department had said previously the first-come, first-served approach was an effort to ensure the program's fairness and the rates charged by couriers were beyond their control. Some applicants have said the way the program is structured leaves them no choice but to pay what it takes to get their files in first, a system that particularly hurts applicants from outside Ontario, who have to pay higher delivery fees just to get them to the office. "If you're telling me that we could find a better way to handle this so that people don't have to pay these high fees to couriers, then I accept the point," McCallum said Wednesday. "The exercise has been completed now for 2016 but we will have a year to figure out ways in which we might improve that process for the next year."